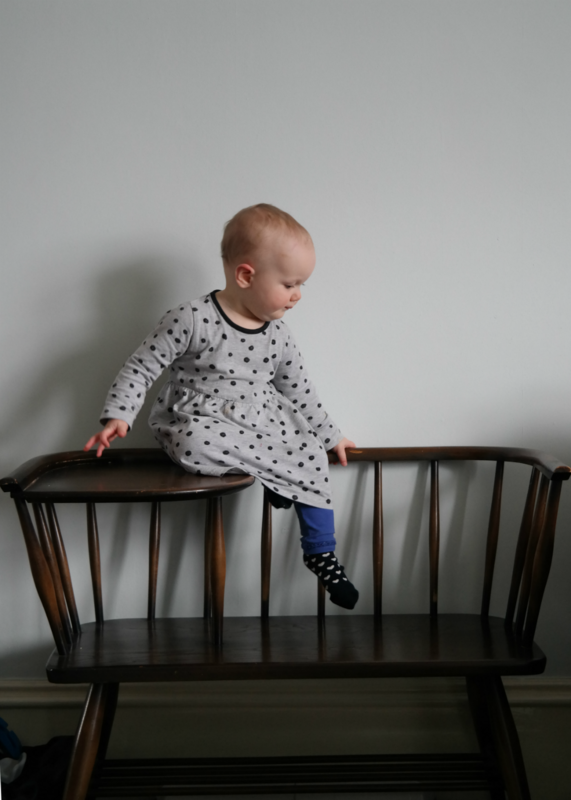 Do you know about baby Wonder Weeks? They are the points at which the majority of babies take massive developmental leaps forward. While they master their new skills or adjust to their new knowledge, they tend to be grouchier and clingier than usual and have even more trouble sleeping. There's an expensive book and a cheap app which explain them in much more detail. Anyway, MM is currently going through a Wonder Week (it's a misleading name - most of them last for several weeks). Specifically, she is going through the Leap of Programs. This is when babies learn about sequences of actions - that, say, getting their coat and shoes and putting them on and going down the stairs and getting in their buggy is "going out". Most of the parents I've spoken to found this leap particularly hard. We found the last one tricky. This one, we're absolutely loving. That's right, Other Parents: we are loving a Wonder Week. This is the leap which lets MM take charge of more of her life and she is so incredibly happy about it. She is able to feed herself without assistance. She is able to put herself to bed (although she still wants one of us - ideally me - to sit beside her until she falls asleep, and good grief that is taking several million decades a night at the moment). She is able to make it known that she wants to play a specific game or leave the house or watch TV or have some food. She is able to tell us that nappy-free time needs to end immediately. She will bring us a cardigan if she's cold. She has realised that she likes to make people laugh and she is enjoying exploring her world. 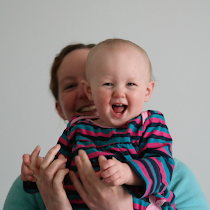 Unlike previous Wonder Weeks, she is pretty consistently cheerful at the moment. The tears come when one of us tries to help her with something she's determined to do on her own ("You've been trying to put that sock on for forty minutes, MM, and we need to leave the house..."). There's the occasional thirty second tantrum because we won't let her do something fun like swallow gravel or ferret around in the litter tray. But, overall, she's very happy. She has always seemed like an independent girl and that's something we've consciously encouraged. We've given her a lot of freedom over her play, putting all of her toys and books within her reach so she can switch between them at will. It strikes me as unfair that toddlers can't reach to put the light on in their own bedroom so, during the shorter days, we (somewhat grudgingly, our budget being what it is) put the light on in her room as soon as it got dark so she could go through there whenever she wanted. Moving her out of her cot at an early age means that she is never trapped in bed. Her clothes are on a low rail so she can choose what to wear (on those rare occasions that she's interested). This leap takes all of those things from being a nice theory to being choices she can actively make. She is loving it. From our point of view, she's hilarious at the moment (though we try not to let her know we're laughing at her!) and it's taking a lot less effort to look after her. She doesn't want to be shown things; she wants to discover them for herself. Where she used to want near constant attention, at the moment she will happily potter around on her own. When she wants to interact, she will play actual games with us; when she finds something funny, she looks at us to check that we got the joke, too. She is so much fun to be around right now. When I was pregnant, I remember feeling awed that I would (apparently) love this baby even more than I loved the cats. And I did. It was staggering, the amount of love I felt for this child, from the moment that our eyes first met; I didn't think it could possibly increase. This leap is bowling me over. She is becoming her own little person. She is a brave, funny, curious, determined, capable, creative girl and the more of that personality which appears, the stronger my emotions seem to become.